This visit has been a long time coming. In the past I’ve talked with Frankie a little at local steel jams here in Kansas City. And we’ve planned for a while to get together and sit down and have him talk, show me his secrets, and tell me stories. Why? Because Frankie comes right out of the western swing and jazz traditions of the midwest where he’s spent most of his life (outside of his stint in Nashville and touring with Cowboy Copas.) For a fantastic bio on Frank see Mike Neer’s article about him on his blog. So, I was stoked and showed up to his place with my single-8 C6/A7 low F axe. 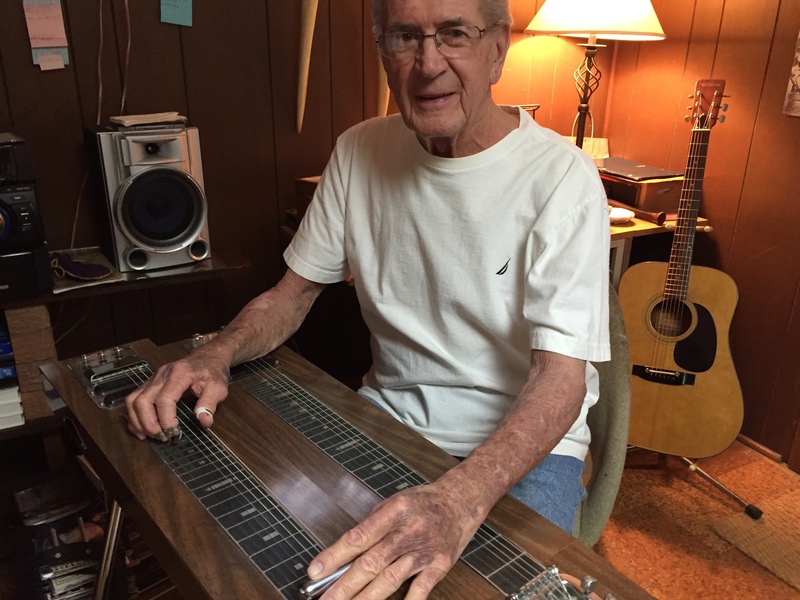 This tuning is the one I know best for lap steel and in my mind the best tuning there is. And so I’m ready to learn some lap steel tricks and stories. That’s basically how I thought this visit would go. But, here’s what I learned in one sentence: Go get more familiar with Leon McAuliffe’s E13 tuning because it’s jazzy as it gets. Frankie has used this tuning almost exclusively for decades. And does so because of his association with Leon McAuliffe. He knew him personally and Frankie’s band would fill in for Leon McAuliffe and His Cimarron Boys at the Cimarron Ballroom in Tulsa. So, I left that day understanding I need to investigate Leon’s E13 tuning and come back. And yeah, Frankie did tell me stories that made my head spin around like a top! Edit: One more thing. I’m not the first guy to seek out Frankie because of his valuable connection to the past. Steel players with huge reputations for other tunings and approaches like Bill Dye, Russ Wever, (both of which are Kansas City guys), Lee Jeffries and Mike Neer have known this guy for a long time. This entry was posted in blues, jazz, lap steel, Uncategorized and tagged blues, jazz, KCmusic. Bookmark the permalink.